As with all Bell & Ross watches, the BR MINUTEUR TOURBILLON PINK GOLD is first and foremost a measuring tool, focusing on readability, functionality, accuracy and reliability. Stemming from a desire to fit a timer function with independent reading to a highprecision mechanism, it incorporates four watchmaking complications around a main timepiece. The combination of functionality and mechanical sophistication is what makes this watch unique. With the BR MINUTEUR TOURBILLON PINK GOLD, Bell & Ross has gone far beyond the traditional know-how of fine watchmaking to create the instrument of the future. consolidated skills of in-house engineers to meet the challenge of mechanical laws. The watch incorporates a chronograph timer, which measures time lapses in hours and minutes from a chosen moment. The accompanying flyback function is a system for quickly resetting to zero and instantly relaunching. This optimises reactivity and accuracy when several time intervals have to be measured in succession. This large counter displays two graduations for reading on two timescales. • The external indexing provides traditional reading of sixty graduations symbolising the minutes. • Inside, ten sectors delimit the tenths of hours. This segmentation proves extremely advantageous for some professionals who calculate the length of their assignments in decimal mode. In addition to the time information, two small counters are located at the intersection between the main timepiece and the Timer Flyback. • At the top, a power reserve indicator gives the remaining operating time on a scale of three days. • At the bottom, an independent small second shows at a glance that the watch is working correctly. 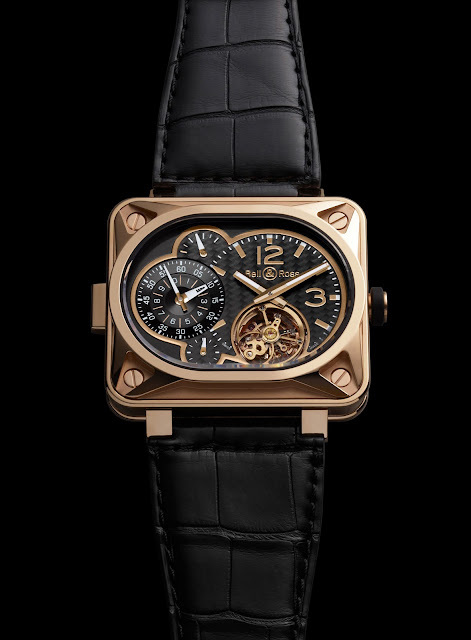 The BR MINUTEUR TOURBILLON PINK GOLD owes its sophistication to the quality of its movement, its accuracy and performance, but its unique architecture is an equally attractive feature. Technology is brilliantly illustrated in its case through the carbon fibre of the dial and the aluminium of the movement bridges, which provide extra strength. Its angle rib structure also helps in maintaining solidity. And as the finishing touch to its superlative aesthetics, the BR MINUTEUR TOURBILLON is trimmed with pink gold. The high-tech measuring instrument is therefore converted into a priceless instrument. 10/10th of hours). 3-day power reserve indicator. photoluminescent coating to optimize night reading. Glass: Anti-reflection sapphire crystal. (Top and back).